Project Financing - KOGENERACJA S.A.
at the Wrocław Combined Heat and Power Plant for K1, K2 and K3 boilers. The “Construction of a Wet Flue-Gas Desulphurization System at the Wrocław Combined Heat and Power Plant for K1, K2 and K3 Boilers” project is being carried out under a co-financing agreement between the Ministry of Environment, through the National Fund for Environmental Protection and Water Management in Warsaw, and Zespół Elektrociepłowni Wrocławskich KOGENERACJA S.A. The project was financed using the funds available under the 2009-2014 Norwegian Financial Mechanism as part of the PL04 programme entitled “Saving Energy and Promoting Renewable Energy Sources”. Construction of a gas-based cogeneration source at the Zawidawie Combined Heat and Power Plant. 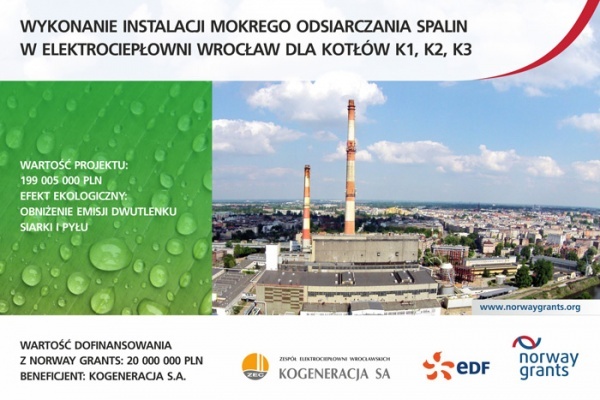 On 11 June 2012, Zespół Elektrociepłowni Wrocławskich KOGENERACJA S.A. signed, at the office of the Lower Silesian Intermediate Body, an agreement for the co-financing of a project named “Construction of a Gas-Based Cogeneration Source at the Zawidawie Combined Heat and Power Plant”. 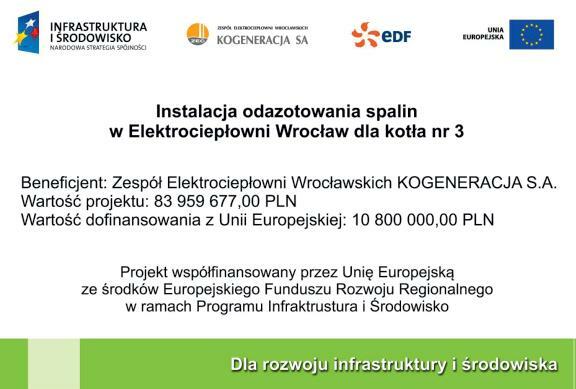 The Company received a non-repayable grant of PLN 2,770,731.71 from the European Regional Development Fund as part of the Regional Operation Programme for Dolnośląskie Voivodeship, Priority 5 Regional Environmentally-Friendly Energy Infrastructure (Energy), Action 5.3 Heating and Cogeneration. The project envisaged the construction of a gas-fired CHP unit at the Zawidawie Combined Heat and Power Plant, intended to satisfy 100% of demand for thermal capacity outside the heating season (hot water for taps) and support water boilers during the heating season (operation of the CHP unit as part of the base load) and, as a side benefit, generate electricity with an overall efficiency of more than 85%. The project was mainly intended to satisfy the demand of local customers for heat and electricity with highly efficient conversion of the chemical energy of primary fuels, which is the key advantage of cogeneration systems. This technology ensures high energy efficiency by reducing the unit consumption of primary energy, which, as a result, improves the state of the environment. The environmental benefits of using the CHP unit are reduced emissions of harmful substances, particularly greenhouse gases, into the environment. (Polski) Rozbudowa sieci ciepłowniczej w południowo-zachodniej Świętej Katarzynie, w rejonie ulic: Wiśniowa, Różana, Parkowa w latach 2013-2014. Projekt dofinansowany przez Unię Europejską ze środków Europejskiego Fundusz Regionalnego oraz z budżetu państwa w ramach Regionalnego Programu Operacyjnego dla Województwa Dolnośląskiego na lata 2007-2013 (wysokość dofinansowania: 294 760 zł).